The tribe has spoken: Pink is the color of the season, and not just for your lips or cheeks. From blush tones, to rich corals, any shade of this ultra-feminine hue is sure to turn heads this season. So channel your inner Elle Woods, throw on your vintage “Pink Ladies” jacket and embrace this subtle, yet statement making color. The key is finding the right shade for your skin tone. Unfortunately, we are all not blessed with that fresh-from-the-beach glow, so choosing a pink that complements the palest of skins can sometimes be challenging. Luckily, there is a wide variety of shades hanging on the racks to best suit all hair and skin tones. Taking style cues from my favorite celebrities, here are some of my suggestions for matching the perfect pink to your skin. Once you have completed this “Pink-ucation” come by Beckett to shop the latest blush-tone styles. 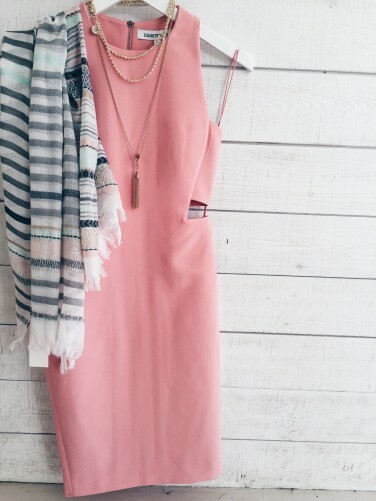 Go for lighter shades of pink that have a little tan undertone. This creates a sophisticated tonal look that is very on-trend and chic. To make the your fair skin really glow, stick to soft corals and rose hues. These richer tones will be a great contrast with your dark locks while complementing your fair complexion. Well you lucky lady can literally wear ANY shade of pink… but if I have to choose my favorite shade it would be peachy-pink. The orange undertones mixed with pastel pink are a winner combo for your amazing skin. Ballerina pink is your color! Not only is it this seasons HOTTEST HUE, this icy pale color is gorgeous on olive/ tan skin. Be careful to avoid any shade with tan undertones…stick with pale, soft pinks and you skin will literally glow! Hey pretty lady, you should tackle the mauves, and taupe-pinks head on! Your bronzed skin and golden locks paired with darker, richer pinks creates a bold luxurious color palette. Feeling inspired? Shop all these looks seen here on HOUSE ACCOUNT. Download the app, follow Beckett, and start shopping!